MEF is pleased to announce it is expanding opportunities for professional certification with a new roadshow offering a variety of special classroom and virtual training options focused on teaching the skills needed to build automated, virtualized, and interconnected networks supporting dynamic MEF 3.0 services. MEF’s Professional Certification Roadshow will be held in cities worldwide during October through December 2018, including at the Layer 123 SDN NFV World Congress in The Hague (8 – 12 October) and at MEF18 in Los Angeles (29 October – 2 November). A list of participating MEF-ATPs and their special course offerings is provided at https://mefprocert.com/home/mef-procert-roadshow . MEF also announced that five of its Accredited Training Providers (MEF-ATPs) are already prepared to deliver training in preparation for taking the MEF-SDN/NFV certification exam and will be offering classes in the weeks ahead. Those organizations are Carrier Ethernet Academy, Criterion Networks, Perpetual Solutions, SDN Essentials, and Tech2000. The MEF-SDN/NFV certification exam is built around the key themes of “Design, Deploy, Manage”, and details and references are contained in the newly released examination blueprint. Professionals seeking to validate their competencies must be able to demonstrate their abilities in various design, installation, and security scenarios involving SDN, NFV, and instances when virtualized objects such as VNFs (virtualized network functions) are deployed into SDN architectures. The value of skills certifications continues to grow, especially in networking. A recent study revealed that 91 percent of employers use IT certification as a reliable indicator of a good candidate in the hiring process and that certified IT staff routinely earn higher salaries than their noncertified counterparts. MEF now offers three certifications as part of its comprehensive Professional Certification Framework. These include the MEF-SDN/NFV Certified Professional, MEF Carrier Ethernet Certified Professional (MEF-CECP), and MEF Network Foundations (MEF-NF) certifications. 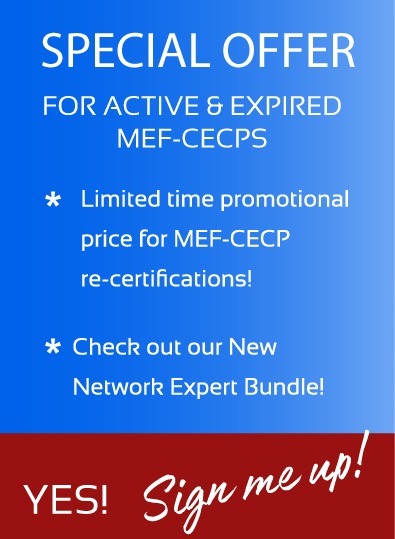 Individuals who obtain all three of these certifications qualify for the coveted MEF Network Expert certification.